Marvel’s merc with a mouth is having some fun! Collect Deadpool as a Panda Bear, Chicken, Viking, Mermaid, Punk Rocker and many more. Each stylized vinyl figure measures 2 1/2-inches tall and comes packaged in blind boxes. Collect them all! 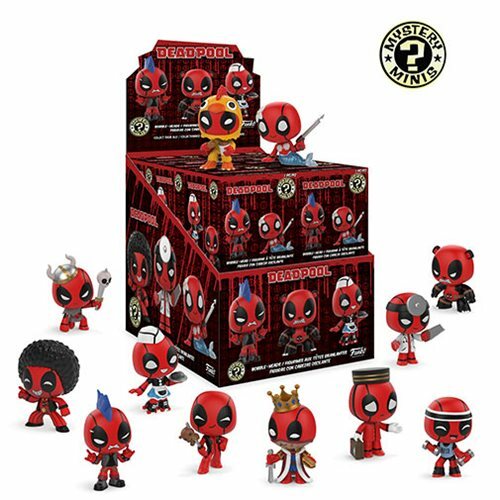 The Deadpool Playtime Mystery Minis Display Case includes a total of 12 individually packaged mini-figures. Breakdown not available at this time. Please note: Item selection is random. Items are in blind packaging. We cannot accept requests for specific items, nor can we accept returns on opened items. You may receive duplicates. Please note: This item may have variants randomly inserted throughout the production run. We cannot accept requests for specific variants, nor can we accept returns on opened items. The item you receive may be different from the one pictured.